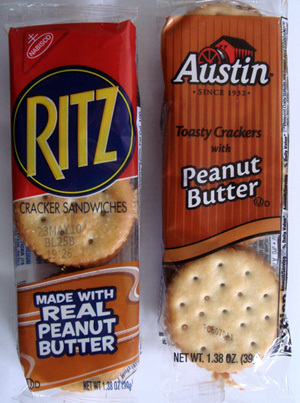 I like the Ritz cheese sandwiches better than the peanut butter. I love that fake powdery cheese, as horrible as I know it is! I think everyone eats these out of desperation from a vending machine. It’s either these or the gummy fruit snacks. Voted for Austin since I grew up eating them. 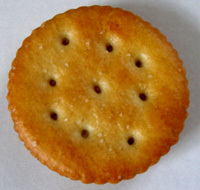 Actually prefer the Cheese Crackers with Peanut Butter than the Toasty Cracker version, even though there isn’t a noticeable cheese flavor in them. 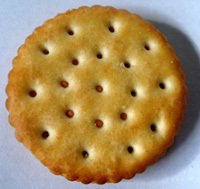 Ritz. Like the taste,and unless it’s deli ham,don’t like toppings. End of story,period. I have to say this, until there is a peanut butter cracker sandwich made with crunchy peanut butter, I will always prefer homemade. I like that Austin has a peanut butter and jelly version, and that its grape, because I don’t like strawberry. Neither! Give me a pack of Lance.